Cast iron cookware is as durable as it is frugal. When properly seasoned, cleaned and maintained, your pots and pans will last for generations to come. Seasoning, or curing, a cast iron pan is the key to getting that perfect non-stick surface that makes cooking with cast iron a joy. If you skip this step, absolutely everything will stick to the pan. Coat your cast iron cookware liberally with vegetable oil or shortening. Be sure to do the inside and outside. If there's a lid, do it, too. Then, place your cookware in a 300-degree oven for one hour. Remove, and wipe off any liquified shortening. Your pan is now seasoned! To avoid a mess in the oven, place a piece of foil under the pan. A true non-stick surface takes time to form. To avoid cooking frustrations, only use your pan for meats and other fatty foods in the beginning. Wash your cast iron in hot water immediately after use. Due to concerns over bacteria, you may want to wash with soapy water – though there are many cast iron users who feel it’s best to stick to water only. Whichever route you choose, be sure not to scrub too vigorously, and take care not to submerge the pan in water. Dry your cookware completely. Cast iron will rust if it isn’t dried immediately after washing. Start by towel drying your cookware. Then, place it on the stove over low heat for a minute or two to pull out any remaining moisture. If desired, lightly coat the inside of the pan with oil, and heat for a minute or two longer. This will help restore any seasoning that might have been lost during washing. Store the pan with the lid off. To further protect against rusting, store your cookware with the lid off. Many cast iron users also recommending placing a paper towel inside the cookware to absorb any additional moisture that may be present in the pan or the surrounding environment. Cook over low heat, to avoid damage to the pan. Use plastic or wooden cooking utensils to prevent scratching. Remove acidic foods from your pans immediately after cooking, and wash promptly to prevent damage to the seasoning. Do not store foods in cast iron as this can break down the seasoning. Never submerge cast iron in water. Never put cold water in a hot pan; this can cause the pan to crack or warp. Do not wash cast iron in the dishwasher. Rust indicates that a pan is not properly seasoned. This can occur when a pan is new, and not fully broken in. It can also occur when the pan has been scrubbed too hard, or not dried adequately after washing. To remedy the problem, scrub or sand off the rust then re-season your pan. If food is sticking to your pan, it’s a sign that the pan isn’t fully seasoned. To achieve the desired non-stick surface, you will need to re-season your pan. You may also find it beneficial to lightly oil your pan before and after each use and to cook fattier foods until a deep seasoning develops. Bare in mind: a true non-stick surface develops over time, and after much use. Start by scrubbing out all of the stuck on food, just as you would with any other pan. Then, once the pan is dry, evaluate the condition of the seasoning. Are there areas where the seasoning was removed? 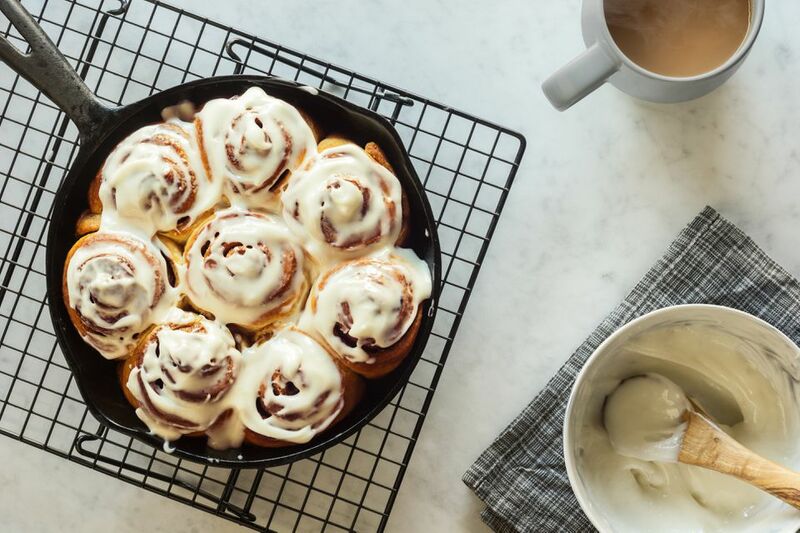 If so, you’ll need to re-season the pan before you can use it again. The Bottom Line: Cast iron cookware is very forgiving. Learn how to clean and season your cast iron, and you’ll have it forever.